Psychology graduates are in-demand: according to the Bureau of Labor Statistics, the number of psychology professionals is projected to grow by 19 percent between 2014-2020, about three times faster than the national average. Many of these new positions - case managers, rehabilitation managers, social service managers and more - will require at least a master's degree. Others will require master's degrees plus Doctor of Psychiatry (PsyD) or PhD degrees. 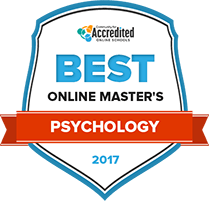 The following guide outlines how online master's in psychology degrees commonly work, highlights some of the best online master's in psychology degrees and provides resources for finding the right program for you. Psychology professionals pursuing master’s degrees may find that online programs fit their schedules and budgets better than face-to-face coursework. As demand for these programs grows, so do the number of online degrees available. While this trend offers students new options, it can make it more difficult to sift through them and find programs that suit them best. To simplify the process, we’ve developed a ranking system to discern the best online master’s in psychology degrees. We evaluated schools using a number of factors, like not-for-profit status, graduation rates, tuition costs, student support services and job placement rates, and compiled the top schools here for easy review. Graduate students who pursue the general clinical master of psychology degree program at Eastern Michigan University will be prepared for master's level clinical practice and licensure. Upon graduation, students will emerge from the program as limited license psychologists (LLP) in Michigan who are prepared to design and analyze clinical research. Graduate students will have access to a variety of academic and research tools, including those affiliated with the university's library services. They will also benefit from academic advising, technical help, counseling, career services and access to the university's vast alumni network. The graduate training in program evaluation at Michigan State University is offered completely online. The program, which combines both real-world experience and theoretical academic knowledge, requires distance learners to consult with both instructors and their peers to tackle skill- and knowledge-building activities. Students will also complete a supervised practical application course over the term of two semesters. Students will gain hands-on experience by working closely with evaluation practitioners in a professional setting. Upon completion, students will be prepared for careers as professional evaluators at the federal, state or local levels, as well as in the private sector. The Syracuse University psychology graduate program is led by instructors who are renowned in the field for both practice and research. Graduate students can choose from four separate programs, each with its own specialization, and they will have the opportunity to receive financial support with research assistantships, clinical assistantships and teaching assistantships. Students will publish their findings in peer-reviewed journals, and then present those findings at industry conferences. There is also a program called FPP, or future professoriate program, which enables students with professional academic aspirations to pursue university-level training and certification. The master of science in experimental psychology program at Seton Hall University boasts very low student-teacher ratios, and large numbers of graduates are currently employed in the field or went onto pursue PhD programs. Upon graduation, students will be immediately qualified to enter a doctorate program or begin work in a research-intensive professional position. Possible careers include laboratory assistant, academic researcher, college instructor and science writer. There are three possible concentrations, all of which require the completion of a thesis, as well as two non-thesis specializations. All students, however, will have access to the university's cutting-edge laboratories and facilities. The Nova Southeastern University School of Psychology offers graduate programs that culminate in both master of science and specialist degrees. Upon graduation, students will be able to move on to PhD-level degree programs, begin clinical research, begin professional practice or advance in their current fields. The MS program offers six individual concentrations. The specialist program, which can be completed in three years, requires students to possess at least a bachelor's degree. Students will have access to state-of-the-art facilities and research centers, and will benefit from academic advising, career services and library services. The central purpose of the Ball State University master's degree programs in psychological science are to prepare students for doctoral work and to present them with opportunities to conduct research. It is common for faculty to collaborate with students on projects. Master of arts degrees are available in both clinical psychology, and cognitive and social processes. The vast majority of students seeking assistantships find one, and the program boasts high numbers of graduates accepted into doctoral programs. Prospective students are encouraged to participate in a live, online webinar where they can learn about the program, meet students and ask questions. Master's degree options at Wright State University-Main Campus include industrial organizational psychology and human factors. Department-specific academic advisors help students plan their degrees, and fulfill all the program requirements. There are many organizations available for graduate program participants to join, including Psi Chi and the Psychology Club. Each faculty member maintains his or her own research facility, and on-campus laboratories are supplemented through partnerships with several local specialty facilities. The university owns the Virtual Environment Research, Interactive Technology, and Simulation facility, which is housed in the Air Force Research Laboratory at Wright-Patterson Air Force Base. The clinical psychology graduate program at Barry University culminates in master of science degree. Students will graduate prepared for either entry into doctoral programs or to begin work in the field of mental health. There is a 60-credit track, which qualifies students for work as mental health counselors in Florida, and a 36-credit track, which prepares aspiring doctoral degree candidates. The College of Arts and Sciences hosts a Preview Day, where prospective students can learn about programs, ask questions and meet the faculty. Students considering entering the program are encouraged to schedule a visit to the school. The Department of Psychology and Brain Sciences at Boston University offers an eight-course master of arts degree that can be completed in one year. Students will explore a wide range of societal, behavioral and cognitive subjects and issues. Faculty not only supervise academic work, but coordinate with students for research projects. The program is open both to dedicated psychology students and students with minimal experience in the field of study. The program does not, however, qualify students for professional practice. Students are required to complete a minimum of at least an introductory psychology course. There is no thesis requirement, but students must complete a research apprenticeship. Graduate-level psychology students can pursue a master of science degree in psychological research at Temple University. The program covers advanced coursework and research-intensive study, while instructing students on professional development. The program is intended for students who intend to progress to a doctoral program involving any study in the field of psychology. The program, which can be completed at the main campus, can be finished in two years. Students must enroll full time. The interdisciplinary program prepares students for careers in universities, the private sector, research, consulting, and the nonprofit and marketing sectors. Online master's in psychology programs can vary in a number of ways, from overall focus to attendance options. Once students decide what they want in a program, they can use this tool to find programs information such as degree level, subject, accreditation, cost, population, and public or private school type. Students pursuing online master's degrees in psychology programs can generally complete their studies in 18 to 36 months, depending on individual programs and course loads. Master's students will need to have a bachelor's degree (though not necessarily in psychology), and as much as five years' work experience in order to apply. An advanced degree in psychology will explore subjects like the history of psychology, theories of personality, and principles of psychology analysis. Prospective students will likely already have an idea of the field concentrations that interest them most, e.g. clinical psychology, education and research, organizational psychology and more. Prospective students should prepare their applications to online master’s programs with with great care. Psychology degree admissions officers tend to evaluate applicants using traditional graduate school entrance requirements, like test scores and GPA, but also consider one’s character and passion. Applicants should use the application process to showcase their interests, experience and dedication to the field. Many master’s programs in psychology offer specialty degrees in educational psychology, applied psychology or organizational psychology, to name a few. Heading into the application process, students should have a strong idea of in which direction they will head. This will help them choose a course schedule, specific professional organizations, and work or internship opportunities in the field. Students who would like to practice clinical psychology should identify programs that align with state licensing requirements, particularly if they intend to work in a different state. A general psychology master’s from NOVA Southeastern University, for example, will not allow graduates to practice in Florida; a master’s of science in counseling will. Applicants need to have an idea of what they want to do and where they want to go so they can be sure to start on the right path. Admissions officers will consider a student’s GPA during the application process, which can be quite competitive. Some programs require a cumulative 3.0 GPA. If a student had poor grades during their bachelor’s programs, it may be more difficult to get accepted. Non-traditional, better-off-paper applicants should use their references and personal statement to make up for poor scores in this area. Applicants should take advantage of every opportunity possible to mitigate the costs of their master’s degree program. This includes looking out for merit (GPA)-based subsidies, federal aid, and private scholarships. Individual degree programs and offices may have a scholarship or financial aid sector for which students can apply, and many professional psychological organizations give financial aid, too. Prospective students should check in with their adviser or admissions office for additional information. Students should ask their current supervisors, professors or community leaders for references. References are required for many master’s in psychology programs, and offer an inside look into an applicant’s character, personality and work-ethic. Admissions officers want to know about an applicant’s work experience, skillset and passion for the field. Some schools require students to interview with a faculty member or a panel of people in the department. Some offer voluntary interviews. In either case, interviews strengthen graduate school applications, particularly among students with “off-paper” accomplishments best showcased in person or by phone. Admissions officers want to know who they are accepting into their programs, but it is difficult to get an idea of one’s personality or suitability from an application alone. For programs that request an essay or a personal statement, students should seize the opportunity to describe who they are, why they want to earn master’s in psychology degrees, and how they plan to contribute to their community and to the field upon completion. Research is huge in the psychology field, especially if an applicant is seeking an advanced degree. Students that are comfortable with it will have a good leg up on other applicants who aren’t, both during the admissions process and within their studies. Online master’s degree programs in psychology vary, but are generally structured similarly. The timeline can be divided into two sections: coursework and a practicum or electives and capstones. Many research-based programs do not lead to a clinical license, so do not require a practicum. Instead, they have more electives and require capstone projects, such as conducting research. Year 1 will focuses on foundational concepts. Some attention should be directed to choosing one’s required practicum subject and experience as well. Even psychology students who already have a bachelor’s degree need to understand the basics. There is a lot of information in Year 1 of an online master’s program regarding history of the field and theory and analysis, and these ideas will help solidify a student’s personal philosophy regarding practicing psychology. Students should take great care to make connections during Year 1 (and all subsequent years). Relationships with students, faculty, and advisers in your field can lead to big opportunities in the future. Students should get involved in professional organizations of their specific concentration and should develop a presence in their professional community. We can all learn so much from the people who have come before us. Students should be open to finding a mentor-someone who can answer questions and serve as a sounding board. This may be a professor, or a professional currently working in the field. Asking tough questions is OK, as these are the differences that will set some parts of the field apart from others. For example, “Would you take the same path all over again?,” “What do you love and hate about your daily work?,” and “What would you change about your role in the field?,” will elicit responses that may help students carve their own career paths. This is really the time for students to explore different aspects of the general field. In addition to core courses, students may try out additional classes in arenas like sport psychology, human sexuality, hypnosis or stress disorder psychology. As students get closer to graduation, they should keep an eye out for internships and volunteer opportunities within their field. This will help expand their network and gain real-life experience in students’ respective fields. Students required to complete a practicum should research internships as early as four-six months before actually applying to them. Candidates are ultimately responsible for completing all of the requirements that come with graduation. For some programs, that includes a report or project on the field work students completed. For others, different capstones outside of the main field of study are required. While internships are often suggested, they are sometimes required. Students should complete the appropriate paperwork early and begin the work quickly as there may be as schools may require as many as 250 practical hours. Programs that have an educational or research-based track often require graduates to complete a capstone paper or project, such as a research review or study. Topics might include lifespan development, gerontology, and learning theory, among many more. Clinically focused programs require master’s in psychology candidates to complete a practicum. This generally includes as many as 300 hours of clinical experience at on-site and under supervision. Students should look for opportunities at sites that already have training programs in place. Master's in psychology students will likely have many opportunities available to them upon graduation. While some careers will require students to continue and complete a doctorate degree, others only require a master's. Opportunities will vary according to the concentration students have chosen, but there are some exciting prospects across the board. Some graduates may head in the direction of clinical psychology while others become premier researchers and professors. The careers listed here are only some of those available to candidates with advanced psychology degrees. Clinical psychologists treat patients who struggle with mental health disorders and problems. They are responsible for assessing, diagnosing and prescribing treatment for their patients. Many of these professionals manage their own practices, too. Rehabilitation psychologists work with patients that have chronic physical issues, like disabilities or debilitating degenerative diseases. Psychologists often work in clinical settings as many of their patients find everyday tasks difficult. A master's degree will help professionals secure jobs in community colleges and some four-year institutions. As an educator, these professionals are responsible for passing along information to the next generation, and often stay involved in research to further the field. Psychology professionals must have a strong understanding of the field's foundational concepts, especially the theory and analysis of how people view themselves and their role in the world. This course focuses on the study of mental disorders, and topics include biological, genetic and social causes, and effective treatment. Psychologists who follow the clinical therapy path will need keen interpersonal skills, including active listening and communication. This course covers a wide array of subjects, but focuses primarily on how to best help patients in a clinical setting. Students who are interested in the educational side of psychology and the advancement of the field should know key research methods. Topics include qualitative versus quantitative research, data interpretation and representation, and research methods. There are many online resources that can help psychology graduate students transition into the professional arena. Many member-based organizations offer internship and volunteer opportunities, financial aid, and professional development. Some resources help students determine insurance needs and give policy updates, and many offer discounts for educational materials and national conferences. A member-based, grant-awarding organization that promotes the advancement of the field of psychology for the betterment of health, education, and human welfare. A division of the APA, the APAGS aims to support its members through networking opportunities, web education, and internship prospects. A member-based organization, APSSC is a representative body of the student members of Association for Psychological Science. It upholds the goals of the parent organization: to promote psychology as a science, to further research, and to improve human welfare. APSSC also puts an emphasis on improving career development of its members. Administrator of the EPPP exam, the ASPPB holds many state and Canadian province boards as members. Check this group out for information on the exam, which students will need to take if their state board is a ASPPB member. A student organization that has chapters around the world, Psi Chi awards grants to students, holds national and international conventions, and promotes the recognition of psychology among other sciences.